Original atmospheric melodies provide a rich, imaginative, colorful tapestry of sound composed for the cello banjo and performed on cello banjos, banjo-lute, doumbek, sitar and guzheng by one of today’s brilliant multi-instrumentalists. 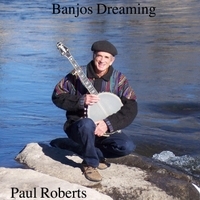 The music on Banjos Dreaming was composed on an unusual instrument, the 5-string cello banjo. With its deep, mellow sound, the cello banjo transcends the banjo stereotype, taking it into a new dimension. Other musicians who play the cello banjo include Béla Fleck, Abigail Washburn and Tony Trischka. To learn more about the cello banjo, visit banjocrazy.com. Paul Roberts is a multi-instrumentalist whose background is in musical composition, concert performing, musical enrichment programs for children, concert production and music therapy. Paul has performed over two thousand concerts in elementary schools throughout the western states with multi-instrumentalist Carla Roberts. He has produced two hundred fine arts concerts for other artists. Paul’s work as a music therapist is featured in Gracefully Insane, a book about McLean Hospital by Alex Beam. In the 1960s, Paul performed with Jon Landau (Bruce Springsteen’s manager/producer) and Kate Taylor (sister to James Taylor). Also in the 60s, he studied sitar with Dr. Shyam Yodh in Boston and with Ustad Rais Khan in India. Paul lives next to the forest in Colorado, where he builds his life around composing and recording. Listening to your music Paul, I am like a bird winging its way across a landscape where there is no time nor space. Your compositions are evocative and magical. I love how you can bring out the mellow richness of the cello banjo. Thank you for your creative inspirations. Paul, the music you are creating for the cello banjo is really unique, almost other-worldly. It is like no other banjo music I’ve heard before. Thank you for sharing this gift.